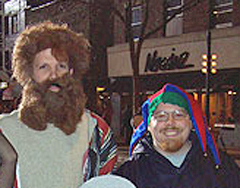 City of Madison officials are making final preparations for Freakfest 2008 — and hoping that once again, the celebration will remain reasonably placid. The mayor says Freakfest is becoming more of a “concert with costumes,” rather than a place to cause trouble. “That&apos;s great, and we will have completely changed the whole tone of the event.” Cieslewicz announced last week that rock band O.A.R. will be the headline act for Freakfest on Saturday. Other performances on the main stage include Donavon Frankenreiter, The Hard Lessons, Thriving Ivory and The Dollyrots. Partygoers will have to pay more this year than in the past. Ticket prices will be $7 in advance and $10 the day of the event.